Parking is charged at the cash desk. For customers of ski rental MONTANA parking is free of charge. 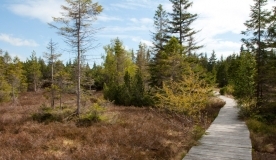 Klínovec – the highest peak of the Ore Mountains – has been a popular tourist destination already since the 19th century. In the 70s of the 19th century, Richard Dotzauer started the Central Committee to promote the employment of the population of the Ore Mountains. In 1882, the Jáchymov community provided a site free of charge for building a lookout tower. In 1884, an octagonal 17m high lookout tower was built on the top. The lookout tower was named after the Emperor Franz Joseph and ceremonially consecrated and handed over for use on 3rd August 1884. In 1893, a brick building with a guest room and a watchman’s flat was adjoined to the tower. Since 1897, a post office station worked in Klínovec. It was equipped by a telephone line in 1906. In 1900, an additional spacious room was built … the Dotzauer Hall. A kitchen was added together with nine guest rooms on the first floor. In the honour of the sixty-year reign of the Emperor Franz Joseph, J.R. Sobitschka instigated the Jubilee Exhibition to be held directly in Klínovec. 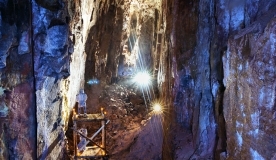 The exhibition aimed at presenting the products of people living in the Czech side of the Ore Mountains. For this exhibition, an exhibition hall was built with a magnificent coffer ceiling in 1907. In the 26 coffers, coats of arms of mining towns from the Czech side of the Ore Mountains were shown. The exhibition, opened with great fanfare on 1st June 1908, was attended by 40,000 visitors and important guests. Since the year 1918, the exhibition hall bears the name Sobitschka Hall. In 1912-1913, the accommodation facilities were expanded for up to 80 guests and a whole big hotel complex with a tower came into existence. In 1919, the tower had to be repaired and in 1929, a further expansion of the hotel was made and accommodation could have been provided to 112 guests. 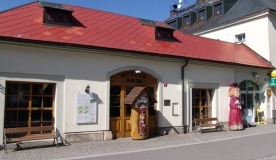 The hotel had already had three large halls - Dotzauer Hall, Sobitschka Hall (formerly Jubilee Hall), and the Müller Hall (after long-time chairman of the Ore Mountains Association in Jáchymov). 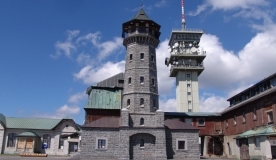 Thus the construction of an integrated mountain hotel resort with a lookout tower was completed. During World War II, the hotel was used for military purposes and after the war, in the years 1951 – 1960, it was used by the army as a recreation centre. No maintenance of the complex was done in those years. In the 70s of the 20th century, the walls of the lookout tower were strengthened by concrete casing (guniting), but which accelerated the gradual destruction of the walls. After 1990, the entire complex was obtained by Jáchymov, which, however, sold it the next year. Soon after, the area was re-sold, and so the hotel and the tower were falling into further decay. The last owner offered the entire resort to the town Boží Dar to buy it. The town council decided on 8th August 2003 that the hotel with the lookout tower will be purchased by company Služby Boží Dar Ltd. (which has been 100% owned by the town Boží Dar), and which was supposed to repair the resort step-by-step. When, in the year 2004, the repairs of the staircase and roof of the tower started, it was found shortly after the start of reconstruction that the tower’s masonry is irreparably damaged to a depth of stone structures. For this reason, in 2009, the town of Boží Dar bought the lookout tower from Služby Boží Dar Ltd. company in order to reconstruct it. That could have been realised only through "The Programme OBJECTIVE 3/3 ZIEL to promote cross-border cooperation 2007-2013 between the Czech Republic and the Free State of Saxony". 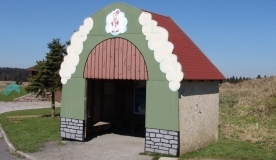 The town Boží Dar implemented two projects. The first project involved the complete reconstruction of the lookout tower and the second project the reconstruction of the access road to Klínovec, including the installation of electricity/water supply systems. In the harsh mountain conditions, both companies have demonstrated their qualities and realized the constructions from June 2012 to October 2013. The total cost of reconstruction of the lookout tower Klínovec rose up to more than 15 million CZK and the costs of reconstruction of the access roads and construction of electricity/water supply systems amounted to more than 55 mil. CZK. The European Union provided 85%, the subsidy from the state budget of the Czech Republic was 5% and the participation of Boží Dar was 10%. 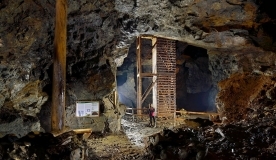 These data indicate not only a very significant contribution of the European Union and the Czech state, but also emphasize and appreciate the attitude and contribution of a small town in the Ore Mountains to preserve this for tourism extremely valuable and important building, without which the Klínovec hill can hardly be imagined.